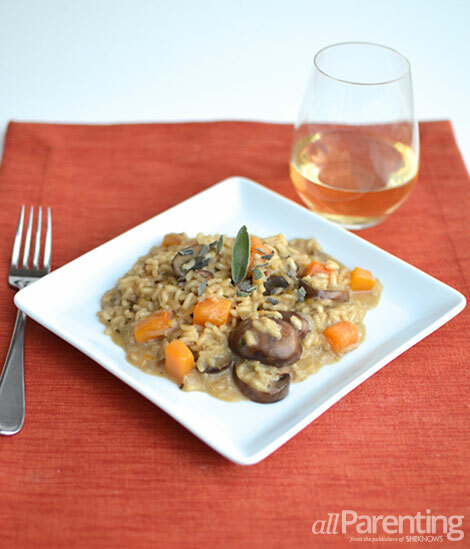 Earthy and seasonal, mushroom and butternut squash risotto is the way to go this fall. Pair with the perfect wine for a nice dinner party meal to really impress your guests! There is nothing more comforting during the cool months than warm, creamy risotto. It's comfort food at its finest. The flavors of earthy mushrooms and slightly sweet butternut squash complement each other extremely well, especially when you add flavor-boosting fresh sage. Soaking dried mushrooms for use in risotto is always a good idea because then you add the reserved mushroom soaking liquid for extra flavor. For cooking, you want to use a wine with a high acidity, one that is "crisp" to add that touch of acidity needed in the dish. For this particular risotto, use an Italian verdicchio, pinot grigio, pinot gris, pinot blanc or even a sauvignon blanc. In a small bowl, combine dried porcini mushrooms and hot water. Let stand for 30 minutes to soften. Using a slotted spoon, remove mushrooms from water. Using a mesh colander, strain the mushroom liquid into a bowl and set aside. Chop the mushrooms and set aside. Pour chicken or vegetable stock into pan and bring to a simmer. Keep liquid hot but on a low heat. In a large saucepan over medium-high heat, melt the butter and olive oil. Add the chopped onions and sauté until browned, about 10 to 12 minutes. Add butternut squash, porcini mushrooms, cremini mushrooms and fresh sage. Stir for about 2 minutes and then lower heat to medium, cover pan and cook until butternut squash is tender, about 6 to 8 minutes. Add the Arborio rice, stir and cook for about 1 minute. Add the wine and stir until absorbed, about 2 minutes. Add reserved mushroom liquid and a ladle of the stock. Reduce the heat to maintain a simmer and cook, stirring constantly, until the liquid is absorbed. Continue adding the liquid, a ladle at a time and stirring constantly, until the rice is just tender and mixture is creamy, 20 to 25 minutes longer. Add the Parmesan cheese, salt and pepper. Stir to mix well. To serve, spoon into individual bowls or plates and garnish with more fresh sage. There are so many different ways to think about pairing wine with this risotto dish. 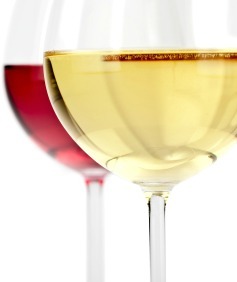 There are also many different countries and wine regions you could head to. A voluptuous rich white like a viognier or barrel-fermented chardonnay pairs smashingly with the butternut squash and creaminess of the risotto. The richness and earthiness of the dish transforms a full white wine into refreshing elegance. Alsatian pinot gris or a Rhone Valley white wine would also pair beautifully with this comforting and creamy risotto dish. Both have wonderful acidity needed to balance out the richness of the dish.